VICTORVILLE - They’re the crews of 10 Tanker Air Carrier’s two firefighting jets based at Southern California Logistics Airport, and they’ve been chosen as the Daily Press “Person” of the Year for 2009. “They’ve become firefighters in the air,” said Cal Fire Capt. Mark Grisamore, who serves with the ground crew for the Super Tankers. Since 10 Tanker’s first jet started test runs in 2006, with a second plane added to Cal Fire’s firefighting arsenal this year, the crews have flown 338 missions and fought 47 fires. They helped battle 11 fires this year alone, including the massive Station Fire and October’s Sheep Fire, which forced the evacuation of Wrightwood. “We’re firm believers that it helped us to slow down the Oak Glen 3 Fire and keep it from going catastrophic,” Cal Fire spokesman Bill Peters said, with several drops from the tankers preventing the September blaze from creeping up to the east side of Big Bear. When they’re called to action, a total of seven 10 Tanker flight crew members man the planes, with four pilots rotating between the positions of captain and first officer and three flight engineers. Another 11 Cal Fire firefighters work the ground crew, along with two-man crews (one from Cal Fire and one private contractor) who fly the tankers’ lead planes, directing them to the drop zone. And a vastly larger “crew” of fellow-SCLA tenants helped get the jumbo jets ready for service, with paint from Leading Edge Aviation, maintenance and support from both General Electric and Boeing, drop tanks installed by Victorville Aerospace and test support from the former City of Victorville Fire Department. The firefighters go through training to become familiar with the aircraft, so that they can help load retardant and marshal the plane in and out of SCLA. This familiarity came in handy this season, when Firefighter Ben Hall spotted a flat tire on one of the tankers and waved the plane in as they were getting ready to take off to help with the Crafton Hills fire. If they haven’t flown a mission in the last seven days, Grisamore said the crews run a proficiency flight, dropping as many as six loads on a target and coming back for a critique of their performance. One tanker and its crew are in Australia now, training to operate there for the first time during the continent’s upcoming fire season. And after three contracted seasons in action, Grisamore said the pilots have started to be able to read what the fire is going to do the way firefighters can and help judge where a drop will have the most impact. It took the DC-10 just eight seconds to drop 12,000 gallons of retardant on the fire. Though the team is a blend of state firefighters and private contractors, Peters said there is a real sense of esprit de corps among them. But the 10 Tanker folks shrug off the idea of being considered heroes along with the firefighters on the ground. San Fran­cisco, Calif. (Decem­ber 29, 2009) – The Cal­i­for­nia Depart­ment of Forestry and Fire Pro­tec­tion (Cal-Fire) has approved an appli­ca­tion by the Bohemian Club for a Non-Industrial Tim­ber Man­age­ment Plan. The plan applies to 2,300 acres at the Bohemian Grove, a rus­tic retreat owned by the Bohemian Club near Monte Rio in Sonoma County. The pro­posal to selec­tively har­vest over a 20-year cycle an over­crowded sec­tion of this for­est will allow the replant­ing of red­wood seedlings and reduce the threat of a destruc­tive wild­fire to old growth trees and sur­round­ing property. Any rev­enue gen­er­ated by tim­ber har­vest­ing will be re-invested in for­est restora­tion at the Bohemian Grove, where the Club has been plant­ing 15,000 red­wood seedlings annu­ally as part of the effort to return this prop­erty to a more nat­ural state. The Club’s plan is pro­jected to result in the reduc­tion of more than 254,000 met­ric tons of car­bon diox­ide emis­sions over the life­time of the plan. The Bohemian Club was founded in 1872 by a group of writ­ers, musi­cians and per­form­ers seek­ing to encour­age cul­tural activ­i­ties in 19th cen­tury San Fran­cisco. The Bohemian Grove, a site used for com­mer­cial log­ging prior to the Club’s own­er­ship, was acquired by the Bohemian Club more than 100 years ago and is in the process of being restored to its pre-settlement condition. 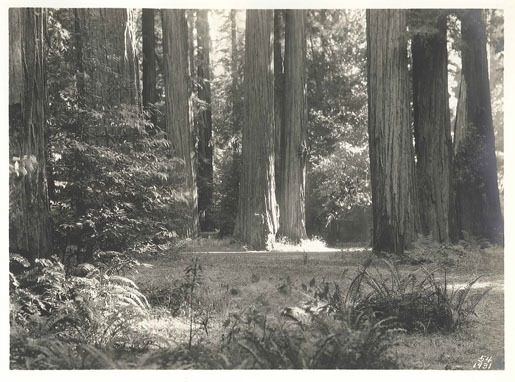 For more infor­ma­tion on for­est restora­tion efforts at the Bohemian Grove, visit www.protectbohemiangrove.org . — LOS ANGELES (AP) - A report says records reveal scant communication between an inmate firefighting crew whose camp was overrun by the massive Station Fire and the commanders who were directing the firefighting operation. The Los Angeles Times reports on its Web site Wednesday that dispatch logs obtained by the newspaper reveal little contact between the crews at Fire Camp 16 and the command center and that fire officials may not have realized the grave dangers that the camp faced. The Times says the logs contain no calls to evacuate the camp or any effort to send help as the flames raced toward it. Two Los Angeles County firefighters died when their truck plunged 800 feet off a mountain road. The Station Fire became the largest in county history as it spread over 250 square miles and destroyed 89 homes. A light earthquake occurred at 10:53:22 AM (PST) on Wednesday, December 30, 2009. The magnitude 4.9 event occurred 22 km (14 miles) NNW of Guadalupe Victoria, Baja California, Mexico. Cal Fire-Butte County welcomes new Chief - George Morris Jr.
OROVILLE — At a simple ceremony Monday, a 41-year veteran of firefighting services who served as Cal Fire-Butte County Chief for 6.5 years, passed a symbolic bugle and the reins on to another longtime colleague. The ceremony at Southside Community Center in Oroville was the official transition of the office of chief from Henri Brachais, 59, to George Morris Jr., 53. Attending were county supervisors local fire agency representatives, family members, and Cal Fire Assistant Region Chief of Northern California Ken McLean and Cal Fire Chief Director Del Walters. Walters presented Brachais with an official retirement letter on behalf of Gov. Arnold Schwarzenneger and Cal Fire. The letter outlined his career, which began in the late 1960s with a job with the California Division of Forestry in Tuolomne and Calaveras counties. He did stints in higher positions in San Bernardino County, and moved to Butte County in the early 2000s. After accepting the framed letter and congratulations, Brachais took the podium. "I've had a great career with Cal Fire," he said. "It's been a wild ride ..."
Noting that fire chiefs use radios to communicate on the field now, the exiting chief talked about the early means of communication: speaker bugles, or trumpets. "Six and a half years ago, the same trumpet was passed to me," said Brachais, holding a large, silver bugle. "I had no idea what it was going to be like." Following tradition, Brachais handed the bugle to Morris, who was then pinned by his wife, Kim. Morris has been in firefighting for 33 years. He first got the idea to work in fire services at the age of 16, when his father, George Morris Sr., suggested he try the state Division of Forestry. The younger Morris said he knew within a week that was what he wanted to do. His two sons, George III and Steven, are also firefighters. The new chief used the address to give his first general orders, telling employees to remember they work for the citizens of Butte County; to look for opportunities to work with "cooperatives" (other agencies) and other fire departments; and support one another professionally and personally. After the ceremony, Walters said the new chief will face many challenges ahead: specifically the economy, but also the interpersonal challenge of running a complex fire department. Walters appointed Morris after a long process that included an evaluation by McLean, and a letter of support from Butte County Board of Supervisors. "George is a stalwart," Walters said. He also noted that Morris has earned the respect and trust of all. Brachais said later he felt anxious and apprehensive about his retirement, but is looking forward to a new chapter. Married since his early career, he and his wife haven't known any other life but firefighting, he said. He said he hopes they'll be able to spend time doing things together, such as camping with his grandchildren, "while we're still young enough to enjoy them." He has nine grandchildren. Brachais said some of his best experiences were during the 17 years he spent as an arson investigator in San Bernardino County, chasing down a serial arsonist. "But my most memorable time was here, last year, because of the sheer number and size of the fires," he said. For Morris, the ceremony and change is good, he said later. He is energized and eager to move forward and lead the men and women in the department. He acknowledged there will be challenges. "Obviously, the biggest challenges are budget related," he said. "Those will be challenges for the next several years." He said the team in Cal Fire-Butte County is "as good as you can find," and that they'll all work together. On Wednesday, December 30, 2009, Cal Fire/Butte County Fire in conjunction with Oroville Fire and El Medio Fire Departments will be holding a live fire training exercise at 6577 Old Olive Highway in the Kelly Ridge area of Oroville. The drill will run from 8:00am through 4:00pm and the most active fire should occur between 9:00am and 3:30pm. Right now the weather forecast is calling for rain throughout much of the day which will limit the amount of smoke that can be seen and from how far away it can be seen but just in case you do see activity or smoke in this area, please be aware that it is an exercise. CAL FIRE NEWS is researching the use of a alleged "heart Drug known as "Lentonitrat" which supposedly is also the same high explosive PETN recently used in the failed airline bomb plot and supposedly can be purchased in Kilo quantities over the internet! So far we have not found any evidence to the contrary. Actually this seems to be "Old News" Same stuff Richard Reid the shoe bomber used and the drug properties were discussed online and print during that time. Also called: Nitropentaerythritol. Available as capsules and tablets. "May be swallowed whole or chewed". Google comes up with a page at http://www.medic8.com/medicines/Pentaerithrityl-tetranitrate.html part of which contains the following information ""PETN is also used as a vasodilator. The medicine for heart diseases, "Lentonitrat", is pure PETN."" PETN (Pentaerythritol Tetranitrate, also known as Penthrite) is one of the strongest known high explosives, with a relative effectiveness factor (R.E. factor) of 1.66. It is more sensitive to shock or friction than TNT or tetryl, and it is never used alone as a booster. It is primarily used in booster and bursting charges of small caliber ammunition, in upper charges of detonators in some land mines and shells, and as the explosive core of detonation cord. PETN is one of the explosive ingredients used in Semtex plastic explosive. During World War II the M9A1 2.36" Rocket Launcher (Bazooka) shaped charge, with 8 oz of pentolite (a mixture of PETN and TNT), could penetrate up to 5 inches of armor. Demolition charge, M118, commonly called Flex-X or sheet explosive, consists of 4 half-pound sheets of flexible explosive packed in a plastic envelope. Each sheet is approximately 3 inches wide, 12 inches long, and � inch thick. Note: The exact explosive contained in an M118 charge varies with the manufacturer. At present, some manufacturers use PETN as the basic explosive. Others use RDX. Charges manufactured in the future may include other explosives. PETN is also used as a vasodilator. The medicine for heart diseases, "Lentonitrat", is pure PETN. PETN was also used by Richard Reid for the plot to destroy American Airlines Flight 63 by trying to ignite explosives hidden in his shoes. The velocity of detonation of PETN at a density of 1.7 is 8,400 meters per second. PETN's formula is C(CH2ONO2)4. Its theoretical maximum crystal density is 1.773 g/cm3. It melts toward 141 �C. PETN does not occur naturally, so the production and use of this kind of compound can lead to contamination of the environment. PETN is subject to biodegradation in untreated or unpreserved urine and feces. There also have been some reports of its degradation by bacteria, whose PETN reductase denitrates PETN into trinitrates and then dinitrates (French et al., 1996). The last compound shown in the pathway, pentaerythritol dinitrate, is degraded further to unknown products. Pentaerythritol tetranitrate, C5H8N4012 (PETN), has a specific gravity of solids of 1.76 and a confined detonation velocity of over 25,000 fps. PETN is used as a priming composition in detonators, a base charge in blasting caps, and a core load for detonating fuse. PETN is very much used in Detonating Cord of which it is the explosive core (Primacord), where it develops a velocity rate of 21,000 feet per second. Detonating cord is insensitive to friction and ordinary shock, but may be exploded by rifle fire. It also detonates sympathetically with the detonation of an adjacent high explosive. PETN is one of the strongest known high explosives with a relative effectiveness factor (R.E. factor) of 1.66. It is more sensitive to shock or friction than TNT or tetryl, and it is never used alone as a booster. It is primarily used in booster and bursting charges of small caliber ammunition, in upper charges of detonators in some land mines and shells, and as the explosive core of primacord. During World War II the M9A1 2.36" Rocket Launcher (Bazooka) charge, with 8 oz of pentolite, could penetrate up to 5 inches of armor. Demolition charge, M118, commonly called Flex-X or sheet explosive, consists of 4 half-pound sheets of flexible explosive packed in a plastic envelope. Each sheet is approximately 3 inches wide, 12 inches long, and 1/4 inch thick. Note: The exact explosive contained in an M118 charge varies with the manufacturer. At present, some manufacturers use PETN as the basic explosive. Others use RDX. Charges manufactured in the future may include other explosives. PETN does not occur naturally, so the production and use of this kind of compound can lead to contamination of the environment. PETN is subject to biodegradation in untreated or unpreserved urine and feces. There also have been some reports of its degradation by bacteria, whose PETN reductase sequentially denitrates PETN into tri- and dinitrates (French et al., 1996). The last compound shown in the pathway, pentaerythritol dinitrate, is degraded further to unknown products. BY WILL VAN SANT and MATTHEW CHAYES - Newsday, Melville, N.Y.
Jim Ryan, a Kings Park father of three who achieved a lifelong dream when he became a New York City firefighter, died Christmas morning of pancreatic cancer, an illness he believed was caused by his months of service in the toxic dust at Ground Zero. Ryan was 48. Mike Ryan said his younger brother underwent major surgery after being diagnosed in 2006, determined to beat the disease. For a time he appeared to be winning, Ryan said, but the cancer returned in 2008. Mike Ryan said his brother was known to have a fighting spirit and a great sense of humor, on full display the night before he was to have his surgery in May 2006. Jim Ryan's doctor, his brother said, came to check on the patient. Jim Ryan was born in Bellerose, Queens, where he attended elementary school. After graduating from St. Francis Preparatory School in Fresh Meadows, he enrolled at Iona College. He graduated in 1983. Mike Ryan said his brother worked for an insurance company after college, but was not satisfied. In 1995, he realized his ambition of joining the FDNY. Jim Ryan's first firehouse was Engine Company 320 / Ladder Company 167 on Francis Lewis Boulevard in Queens. It was from there he joined the first responders descending on Ground Zero after the 9/11 attacks. Mike Ryan said his brother spent six months on the pile at Ground Zero, working in a soup of the 'most toxic stuff that you could imagine.' His brother, and his brother's surgeon, Mike Ryan said, had no doubt his cancer was connected. Though the City of New York doesn't consider Jim Ryan's death to have resulted from work done in the line of duty, Mike Ryan said fellow firefighters had showed Jim tributes that are customary for one who had. In addition to Mike, 50, of Centerport, Jim Ryan is survived by his wife, Magda; two sons, ages 17 and 15, and a daughter, 9; another brother, Bob, 51, of Glendale, Ariz., and a sister, Maureen Miller, 52, of Bellerose. A wake will continue Monday from 2 to 5 p.m. and 7 to 9 p.m. at Brueggemann Funeral Home, 522 Larkfield Rd., East Northport. Ryan's funeral will be 11 a.m. Tuesday at Abiding Presence Lutheran Church, Fort Salonga. A catastrophic fire weather warning has been issued for parts of Western Australia tomorrow. The Bureau of Meteorology has forecast the highest level of fire danger for the Central Wheatbelt, Great Southern, South and South-East Coastal districts, as well as the inland sub-district of the Central West. It will be the first time the new "catastrophic" rating will have been used extensively in the state. A severe to extreme danger is forecast for the inland sub-district of the Lower West, including the metropolitan hills area and the coastal sub-district of the Central West. Very hot conditions are forecast for tomorrow with fresh to strong and gusty winds. The senior forecaster with the Bureau of Meteorology, Adam Conroy, says warnings for coastal parts of the division are severe to extreme. "We expect very hot conditions through the south-west land division and it's going to be fresh to strong northerly winds," he said. "Those conditions combined are going to lead to the potential for a catastrophic fire condition through most parts of the south-west land division away from the west coast." The warning comes after hot weather today. The Weather Bureau is expecting temperatures to reach 40 degrees and strong winds are forecast. Two water bombing helicopters have been stationed in the hills east of Perth which is deemed a high risk area for bush fires. The major Inland Empire wildfires of the first decade of the century all occurred in the late summer and early fall - and especially in October. There have been 11 regional wildfires since 2000 that burned more than 12,000 acres. Total acres charred are in the millions, with countless blazes chewing through a few thousand acres at a time. The blazes left hundreds homeless and cost millions of dollars. Some of them killed residents and firefighters; half were caused by humans. "Something is changing here," said U.S. Forest Service spokesman John Miller. "The season is getting longer, the fires are getting larger, and they're happening more frequently." October of 2002 and 2003 brought three significant blazes to the foothills and high country of the San Gabriel and San Bernardino mountains. The Williams Fire consumed 37,240 acres and burned 76 structures between Sept. 22 and Oct. 1, 2002 in the Angeles National Forest between Azusa and Claremont. That set the stage for the two-fire wallop in late October 2003 that just about brought the Inland Empire to its knees. For nearly three weeks, more than 150,000 acres of chaparral and forest were charred by the Grand Prix and Old fires, mostly in the San Bernardino National Forest. The Grand Prix fire began as a small blaze near a foothill neighborhood in Fontana but exploded two days later with the arrival of Santa Ana winds. It burned nearly 60,000 acres as it raced across the San Gabriels from Fontana to the edge of La Verne. Within days of the Grand Prix's start, an arsonist set a fire in the hills north of San Bernardino. Before it was extinguished, more than 91,000 acres burned, nearly 1,000 homes destroyed and, at its height, 102,000 people were evacuated. The fire, the Old Fire, burned throughout the San Bernardino Mountains, reaching the edge of Hesperia to the north and areas east and north of Lake Arrowhead. At one point, the Grand Prix and Old fires burned into each other in Devore, ironically threatening the massive firefighter staging camp at Glen Helen Regional Park. The 2006 Esperanza Fire was the most deadly of our wildfires, with four firefighters dying in an arson-set fire in the San Jacinto Mountains south of Banning. More than 40,000 acres burned in the fire that began Oct. 29, 2006. In mid-November 2008, the so-called Freeway Complex fire charred 90 percent of Chino Hills State Park while also destroying 187 houses and 30,000 acres in the Chino Hills where San Bernardino, Riverside, Orange and Los Angeles counties meet. The largest wildfire to hit Southern California burned 160,500 acres this past September and early October. The Station fire was finally contained Oct. 16 after burning the equivalent of 250 square miles of the San Gabriel Mountains from Santa Clarita to north of Azusa. "In Southern California, it's not question of if there's going to be a wildland fire," said Cal Fire spokesman Bill Peters. "We know there is going to be." Factors that have contributed to more deadly wildfires in the region over the past decade are extremely dry brush and more homes being built in the urban interface. As people continue to build in the foothills and other unsafe areas, firefighters are challenged by not just combating flames but also saving lives and property at the risk of intervening in the natural process of fire clearing out forests and grasslands. "As those fires are put out, the natural course of fire cleaning out the land every 10-15 years or so, that cycle is impeded," Peters said. "What happens is you have areas that become very decadent and you have fuel that hasn't burned in 20, 30, years or more. That creates more intense and destructive fires." A minor earthquake occurred at 3:02:08 PM (PST) on Saturday, December 26, 2009. The magnitude 3.9 event occurred 24 km (15 miles) NNE of Ocotillo, CA. The hypocentral depth is 14 km ( 9 miles). SAN BERNARDINO, Calif. — A 16-year-old Southern California boy was charged Wednesday as an adult for allegedly starting two arson wildfires in San Bernardino County earlier this year. SAN BERNARDINO - The county's most destructive wildfire, the 2003 Old Fire, may have been started by a group of men who were too drunk and stoned to pull off a robbery. Suspected arsonist Rickie Lee Fowler told Sheriff's detectives that he was in a van with three other men in the Old Waterman Canyon area. Fowler wanted to rob a man he saw as his godfather, John Aylward, who lived on Forest Lane. "Once they got there, they realized they were too drunk and/or high to pull off a robbery. So they drove about halfway down the Waterman Canyon Road, where they parked and continued to get high," Sgt. Frank Bell testified before the San Bernardino County Grand Jury. Fowler then told investigators that he was in the front passenger seat, and he remembered Martin Valdez Sr., and his son Martin Valdez Jr., got out and went to the back of the van. Fowler said he saw them strike a flare and throw it into the brush. But when detectives later listened to the recording of their interview with Fowler, they realized their suspect had also slipped when they asked Fowler how the fire was lit. Bell's testimony was given during hearings in October before the San Bernardino County Grand Jury. The hearings lead to Fowler's indictment Oct. 8 on arson charges and five counts of murder related to the deaths of five men who suffered stress- related heart attacks during the blaze. A sixth person died when he fell from a bridge in Sawpit Canyon while trying to hike back to his mountain home, around law enforcement barricades. Fowler is also charged with special circumstances, which make the case eligible for the death penalty. However, prosecutors have not yet announced whether they plan to seek it. Fire investigators determined the fire was caused by a flare thrown into the brush from Old Waterman Canyon Road. In none of his interviews did Fowler admit throwing the flare, claiming instead that one of his companions threw the flare. Despite Fowler's admission to fire investigators about having a role in the massive wildfire, he has pleaded not guilty to the charges. Transcripts of the grand jury hearing were ordered released Tuesday by Superior Court Judge Michael A. Smith. Fowler's lawyer, Donald Jordan, argued against the release of the 600-page, two-volume transcripts, saying they could be prejudicial to his client and impact his ability to get a fair trial. But after hearing Jordan's arguments in chambers, Smith said much of the defense lawyer's concern about information in the transcripts had already been reported in the press. Except for nine lines of Bell's testimony on page 446, which the judge ordered excised from the now public document. Prosecutors did not challenge the release of the transcripts and said they should be able to find people who have not been exposed to too much publicity. "We have a pretty wide jury pool," said Deputy District Attorney Vic Stull, who is prosecuting the case. The Old Fire ignited on Oct. 25, 2003, near Old Waterman Canyon Road and burned for nine days, blackening more than 91,000 acres, burning nearly 1,000 homes and causing $170 million in property losses, according to the District Attorney's Office. Millions more were spent fighting the blaze. About 70,000 people were evacuated from Del Rosa to Cedar Glen. More than 4,000 firefighters battled the blaze at its peak and protected $7.5 billion in residential and commercial infrastructure, despite the severe losses. Gabriel Padilla, who worked for a Redlands-based tree service, had stopped his overheating truck on Highway 18 on Oct. 25, 2003 and he spotted a white or gray van stop on Old Waterman Canyon Road. A person got out of the van and made a throwing movement, Padilla testified. Immediately after, a fire started. "He like threw something," Padilla told the grand jury. "He walked and then he threw something, like something that was lit." The man who threw the object then ran back to the van and got into the front passenger side door, Padilla said. The van left quickly, headed down toward San Bernardino. But as the van turned onto Highway 18, it ran a stop sign and nearly collided with a Chevrolet Blazer driven by Robert Lansden, who was traveling to the mountains with his wife. Investigators began to suspect Fowler after tipsters reported he had made comments implicating himself in the blaze. Prosecutors said Fowler's interviews with detectives were relaxed and non- threatening. "These aren't interviews where they're thwarting him with cigarettes or threatening him with a gun," Stull told the grand jury. Fowler told investigators he was upset with Aylward, who isn't his godfather but was someone who showed kindness to his mother and brother, because he had kicked Fowler out of his house, according to the transcript. Fowler said they wanted to rob Aylward, but Martin Valdez Sr. and another man, identified as "Dean," got scared. When the robbery didn't happen, Fowler suggested burning Aylward out of his house. "Just animosity, too much anger," Fowler told investigators. He was hurt and upset at Aylward, he said. Aylward told grand jurors that his relationship with Fowler started off friendly but then became contentious. "He had difficulty with the understanding that I didn't want him there because he had a drug habit," Aylward testified. "And he found it difficult to accept that." Aylward said Fowler once took a Rolex watch from him. Valdez Sr. testified before the grand jury that he and his son were living in a trailer in Muscoy at the time of the fire in 2003. The elder Valdez denied he was ever in Waterman Canyon at the time of the fire and said he was not in the van with Fowler. At one point, Valdez Sr. said he couldn't even clearly recall a fire during that time. "I mean, like I say, I don't know the date of the fire, so I don't know if the fire was on when I was living there," Valdez Sr. testified. "I don't recall any fire." In a later interview, Fowler said he took the flare out of the van, but he claimed Valdez Jr. took the flare from him, struck it and threw it. Valdez Jr., 24, was interviewed about his alleged involvement in the Old Fire but was not arrested or charged. He was shot and killed in Muscoy three years ago. In a signed affidavit Fowler gave to investigators while in prison, he admitted playing a role in the Old Fire. "I, Rickie Fowler, decided to inform those that I have chosen to confess to being present at the `Old Fire' in 2003," Stull read to the jurors. "And that it was my intent to light it but got beat to the punch by a friend of mine that was also there. "I am doing this of my own free will," wrote Stull. In a recent jailhouse interview with The Sun, Fowler denied starting the Old Fire and claimed he was tagging with a friend in San Bernardino when flames began racing through Old Waterman Canyon. He recalled seeing large plumes of smoke and ash raining down. The said he confessed to U.S. Forest Service investigators because he was sick of being "badgered" while serving time in prison for burglary. Fowler refused to talk about Valdez, other than to acknowledge that he knew him. Fowler has said he "isn't losing sleep over this" and understands the community's desire to hold an arsonist accountable. And while he admits to leading a life of crime, Fowler says arson is not in his nature. He said he has joined several self-help groups in prison. "I'm trying to learn why I am the way I am," Fowler said. "I want to better myself." Prosecutors told the grand jury that Fowler's intent to burn Aylward's house combined with the evidence and Padilla's testimony makes his culpability clear. "He intended to start a fire in order to damage or hurt John Aylward, his so-called godfather," Stull said. "Again, we don't have to prove that he intended to kill him. He just wanted to start a fire." For Fowler to be convicted of the special circumstances, prosecutors have to prove that he personally started the fire. Bell testified that no offers or deals have been offered to Fowler to resolve the case, nor had anyone from the District Attorney's Office even talked with Fowler. Prosecutors also say no one else is being charged in connection with the Old Fire. The only evidence that points to anyone else in the case, such as Valdez Sr., Valdez Jr., or the fourth man allegedly in the van comes from Fowler, according to Stull. That would make Fowler the key witness at any trials for the other individuals, and prosecutors don't believe he would be a credible enough witness to secure a conviction. "We don't file cases unless we can obtain a conviction by a jury at a trial," said Stull. LOS ANGELES - The U.S. Forest Service summoned several powerful firefighting airplanes in the early stages of the largest wildfire in Los Angeles County history, then canceled and reordered them, causing a two-hour delay in their arrival, according to government records. The records renewed questions about agency decision-making in the critical early hours of the blaze and whether enough was done to stop it. When the arson fire began on the afternoon of Aug. 26, the Forest Service brought in a total of 11 planes and helicopters to help about 200 firefighters on the ground knock down what was then a relatively small blaze of 20 acres (8 hectares), the records show. But the fire kept spreading. Just after midnight, dispatchers called for three air tankers, among the most powerful aerial firefighting tools, to arrive at 7 a.m. The planes were canceled then reordered hours later. But instead of arriving at 7 a.m., as originally planned, the planes reached the site just before 9 a.m., according to Forest Service records obtained by The Associated Press through the Freedom of Information Act. The three air tankers became part of the agency's aerial assault on Aug. 27, the second day it burned in Angeles National Forest. Forest Service officials have defended their use of aircraft. A government report issued last month concluded the wildfire raged out of control because it jumped into inaccessible terrain, not because of the way the agency deployed firefighters or aircraft. Using aircraft to dump water or retardant without ground crews to help out would have been ineffective, the report said. The so-called Station Fire ultimately killed two firefighters, destroyed 89 homes and blackened 250 square miles (647 sq. kilometres) on the edge of Los Angeles. Los Angeles County Supervisor Mike Antonovich has said the Forest Service erred by not calling in more aircraft to drop water and fire retardant in the early hours of the blaze. Tony Bell, a spokesman for Antonovich, said Monday the supervisor wants Congress to investigate how the firefighting was conducted. Forest Service Fire and Aviation Management Director Tom Harbour said Monday the large air tankers would have been unable to get near the fire's critical point near the bottom of a steep, narrow drainage area. The cancellation of the planes, first reported by the Los Angeles Times, was not significant because they could not have been used at that location, he said. The Los Angeles County Fire Department’s Public Information Officers (PIO) have a state of the art command vehicle, giving them the tools they need to keep the members of their community informed during large scale emergency incidents, such as wildfires, extended commercial building fires, and natural disasters. Join FDNNTV.com’s Barbara Brooks for an in depth look at the Freightliner SVI Command Vehicle that was purchased with the help of a FEMA Assistance to Firefighters Grant. Cost: $375,000 plus $25,000 to outfit. A light earthquake occurred at 3:40:43 PM (PST) on Tuesday, December 22, 2009. The magnitude 4.0 event occurred 8 km (5 miles) WSW of Covelo, CA. 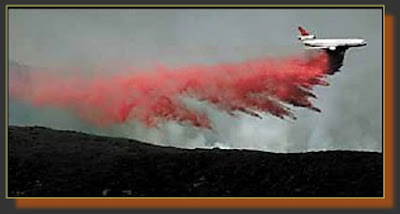 Though the flames of the Jesusita Fire burned out long ago, the firefighting agencies who battled it are now under attack again, this time by an environmental group that claims the use of airplane-dropped fire retardant killed dozens of endangered steelhead trout. Forest Service Employees for Environmental Ethics (FSEEE) — an environmental nonprofit focused on protecting whistle-blowers and pushing reform of the Forest Service's land use policy — filed a notice with the U.S. Department of Commerce on December 16 that it plans to file suit against the California Department of Forestry and Fire Protection and the Santa Barbara County Fire Department. FSEEE maintains that the two fire protection agencies used a toxic flame retardant material that killed endangered steelhead trout during the Jesusita Fire last May. In accordance with the Endangered Species Act, FSEEE must wait 60 days before it can file a lawsuit. "That is to give the Department of Commerce an opportunity to do what this lawsuit would do, and that is enforce the Endangered Species Act," said Andy Stahl, FSEEE's executive director. "This lawsuit goes forward only if the government chooses not to enforce this law." It all started a few days after the Jesusita Fire had torn through the area around Robert Bjorklund's land along upper Maria Ygnacio Creek. Having found a number of dead steelhead trout in the creek that runs through his property, he called for help. In a report on his investigation of the creek on May 11, 2009 — the creek was by then a milky color — Mark Capelli, a recovery coordinator from the National Marine Fisheries Service, said that he observed 30 dead steelhead. Stahl said that in a follow-up on that investigation, a UCSB ecology professor recorded ammonia level in the water 100 times higher than normal. A spokesperson from the Santa Barbara County Fire Department said that although County Fire works with Cal Fire and other agencies during wildland fire suppression efforts, the county itself does not use flame retardant. After more than 30 years with the California Department of Forestry and Fire Protection (CAL FIRE) Chief Candace Gregory has announced her retirement. Gregory, 52, of Madera County, worked in various assignments throughout the state since beginning her fire service career in 1976 with the United States Forest Service in Waldport, Oregon on the Siuslaw National Forest. CAL FIRE’s Southern Region Chief. Her responsibilities include the operations and administration for the Southern California CAL FIRE Units, which incorporate all areas South of Sacramento and the Bay Area to the international border. Gregory has held the position of Region Chief since June of 2006.
administration has made her a valued asset to not only CAL FIRE, but the entire California fire service. the positions of Unit Chief and Region Chief. history of the California Department of Forestry and Fire Protection (CAL FIRE). Gregory will officially retire from CAL FIRE on December 30, 2009. Please join us as we thank Chef Gregory for her more than 30 years of leadership, dedication, and service to the citizens of California and CAL FIRE. After 25 years of service, 15 of which were spent with the Tehama-Glenn Unit, Mickie Jakez is saying goodbye to CalFire. Her last day in the office was Wednesday. "My retirement is going to give me the opportunity to spend more time with my family," Jakez said. "I thoroughly enjoy my job and it's going to be very difficult for me to say goodbye." With six grandchildren and seven great-grandchildren, Jakez said she has no plans to move from her house in Anderson any time soon. "I'm going to miss my job, but I'm going to stay active," Jakez said. "I do plan to volunteer. Probably here at CalFire, the library and school programs and I'm very active in the Redding Emblem Club." Jakez began her career with CalFire in the former Region II office in Redding in 1984 as an office assistant and was promoted from there to assistant business services officer. fire prevention specialist serving as juvenile intervention officer counseling children who have started fires and their families. Jakez has also worked as the Public Information Officer and spent a great deal of time working in the educational field teaching fire safety and prevention at schools as well as at community outreach events. She was in charge of running the information center for the Tehama-Glenn Unit during major incidents, including the lightning series fires that rolled through the county in 2008. "It's a 24-hour-a-day job," Jakez said of running the center. "My job (overall) has been a fun job with lots of rewards and I've been able to work with outstanding people." Her favorite part, as a people person, she says is being able to spend her day talking with people and getting CalFire's messages of fire prevention and safety out to the public. Outside of those from CalFire, Jakez said she has enjoyed working with the California Highway Patrol, Tehama County Sheriff's Department, District Attorney's Office, various news media and the Tehama District Fair Board. "Mark Eidman at the fair has been very supportive of all the activities we've wanted to do at the fairground," she said. Jakez headed up the Volunteers In Prevention program. "[Jakez] built up a reliable team of Volunteers In Prevention who are a core group for fire information, ham radio support, school education programs and community outreach," said CalFire Director Del Walters in a letter. Humble, Jakez attributes many of her accomplishments to her volunteers and community. "I don't think I did anything anyone else wouldn't do," she said. "The Red Bluff residents and this community have been just so great. You ask for help and they are right there." Walters said Jakez, her accomplishments and her innovative prevention projects, such as trading cards and career days, are known throughout the region. "Your career with CalFire has been an accomplished one, which you should be proud of, and one that the people who work with you have enjoyed," Walters said. Jakez received the 1986 Sustained Superior Accomplishment Award. "She's a great lady and she has a fantastic program she developed," said Unit Chief Gary Durden. "She is a doer, but she doesn't want recognition." Durden, Asst. Chief Chuck Schoendienst, who is Jakez' boss, and several others said she will be greatly missed. "She doesn't like to be in the limelight," Schoendienst said. "The nice and reliable thing about her is she doesn't release things before she's supposed to. She's dependable." Durden said Jakez is like an Energizer Bunny, who just keeps going and is always looking for ways to improve her programs. "In my opinion, she's going to be very hard to replace and whoever replaces her is going to have very big shoes to fill," Durden said. "She's our go-to person. She just does everything." Jakez was on the board involved in bringing Relay For Life to Red Bluff along with Durden, Rick Pound and June Morford. Jakez spurs a lot of the community outreach projects CalFire does including work with the Salvation Army bell ringing and food drives, Durden said. "Too often we focus on the flashy, high-flying, grandiose part of CalFire and we tend to forget that it takes everyone to make this car move," said Asst. Chief Dale Kinyon in an e-mail. "Mickie has, for as long as I can remember, been maintaining and motivating, sometimes Shanghaiing volunteers for (Tehama-Glenn Unit). Mickie uses her grandmotherly tactics to get even the most hardened, crusty individuals to donate their time and money to her causes." Jakez assists with the Adopt-a-Family program, Tehama-Glenn Burn and Benevolent Fund Crab Feed and Read Across America, Kinyon said. "I want to personally thank (her) for all the help (she) has given me over the years," Kinyon said. "(She is) truly an unsung here in my book." The eagle has landed - Victoria has finally taken delivery of a super water bomber for the bushfire season. 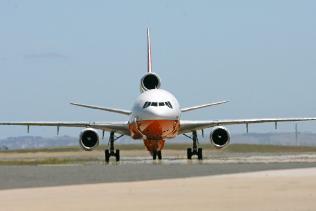 The heavily modified DC10 flew in from the US to Avalon yesterday, on a $10 million lease deal. The first such aircraft to be used in Australia, it can reach any part of Victoria within 45 minutes and soak 1.2 kilometres of bushfire in one dump with its 45,000 litres of water. It is expected to be ready for action by early next month for the worst of the season, and will be based at Avalon. Premier John Brumby said the addition to Victoria's firefighting arsenal was part of a record financing program to make sure the state was as fire-ready as possible. "We have been working with the Country Fire Authority since September to bring a large aerial firefighting aircraft to Victoria for the first time to help protect lives and properties," Mr Brumby said. 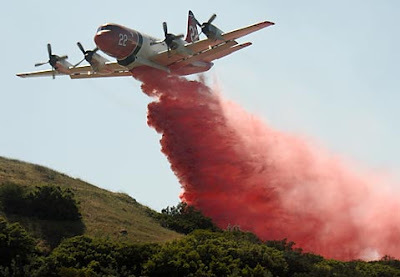 "Large aircraft that can carry up to eight times the water or retardant of smaller firefighting aircraft are untried in Australian conditions. Victoria will lead the way in testing their ability to help fight fires in the peak of this fire season," he said. The plane will be deployed when and if necessary by the state's top firefighters. But both the Department of Sustainability and the CFA have warned that aircraft are not silver bullets in fighting bushfires. The Elvis skycrane arrived in Victoria last month. CalFire has previously contracted for the DC-10 VLAT for three fire seasons, from 2007 through 2009. 10 Tanker Air Carrier has a total of two DC-10s that have been retrofitted as “very large air tankers, which can carry up to 12,000 gallons. Fire crews will intentionally burn debris and slash piles this winter in the brush land between Oak Glen and Banning to reduce the wildfire danger, Cal Fire officials said. The burning will be limited to 8:30 a.m. and 4 p.m. on weekdays. The work will be conducted along the northern edge of Cherry Valley, southeast of Oak Glen and northwest of Banning. The aim is to help keep wildfires from burning into those communities, and to keep fires that do start in those communities from spreading. The project could have started as early as Thursday, but no burning took place, Cal Fire officials said. However, U.S. Forest Service crews did conduct a controlled burn in the Barton Flats area northeast of Oak Glen on Thursday. instruction students have received in the fire academy to meet the requirements set forth for CAL FIRE and the CAL FIRE Basic Wildland Firefighter I course. Successful completion requires students to be in top physical condition. set in HB-4300 for the CAL FIRE Basic Firefighter I, 67 hour training. SLO County Volunteer Firefighter Academy within the last three years. required class for PCF’s and is not paid for by SLO County Fire Dept. What to bring: Full wildland and structural PPE and lunch. attire. No tee shirts or ¼ zip sweatshirts will be allowed in class. Fire. All registration is on a first come first served basis. Phone, emailed, or faxed registrations will not be accepted. Questions: For registration questions, call 805-528-2160. PALERMO — A malfunctioning highway billboard is believed to be the cause of the June 2008 Ophir Fire, according to a statement released today by Cal Fire-Butte County fire officials. After an 18-month investigation, fire officials have determined an electrical failure on a Highway 70 billboard ignited the fire, which burned approximately 1,600 acres and destroyed 21 homes June 10, 2008. Fire officials are still determining whether to seek financial compensation for fire suppression costs, or if criminal charges will be pursued. A firefighter is dead after developing a mysterious rash that sent him to the hospital, according to the Cosumnes CSD Fire Department. 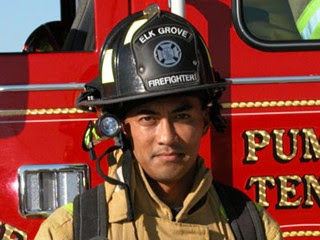 Richard Ibarra, 42, died Wednesday at the UC Davis Medical Center in Sacramento in what the fire department says could be an in the line of duty death -- the first in the department in more than 100 years. Cosumnes Battalion Chief John Michelini says Ibarra was very healthy until developing the rash. It caused severe internal damage, and doctors have yet to diagnose what it was. A coroner will determine the cause of death during an autopsy. Ibarra was surrounded by his immediate family and his firefighting family when he died, according to Michelini. Ibarra has been with the Cosumnes Fire Department since 1999. He is survived by his wife and two young children. Memorial service plans are pending and we will keep you updated. WRIGHTWOOD, Calif. (KABC) -- Investigators say a wildfire that burned more than 11 square miles in the San Bernardino National Forest near Wrightwood may have been deliberately set. Investigators say it was human caused, and may have been arson. One home and four other structures were destroyed in the October "Sheep Fire." The fire also forced the evacuation of Wrightwood. Investigators have ruled out downed power lines, lightning, or other causes. The starting point was near Lytle Creek and Sheep Canyon roads. Investigators are asking anyone who may have seen suspicious activity in that area on October 3rd to contact authorities. On Tuesday the Los Angeles County Fire Department recognized good Samaritans, Drew Bruno of Agoura Hills, John Hayden of Agoura Hills and Chris Kessler of Moorpark. The three men helped a motorist who was stranded in a vehicle that crashed about 300 feet down an embankment in Malibu during rainy conditions on December 7th. Authorities have launched a criminal investigation into the case of the former Anderson Fire Protection District chief who resigned earlier this year amid an investigation into possible misconduct. The revelation that former Fire Chief Joe Piccinini is under investigation by Redding police came Monday at a hearing in which Shasta County Superior Court Judge Monica Marlow ruled that the district must turn over copies of its investigative report to the Record Searchlight, which sued under the state's Public Records Act to get the documents. "The public interest in disclosure outweighs the public interest that would be served by withholding the records," Marlow wrote in her ruling. "The public interest in disclosure is high because of the position held by Mr. Piccinini and the need for the public to verify accountability." Michael Fitzpatrick, the Anderson attorney representing the fire board, argued that the report was exempt from disclosure because it fell under the protection of attorney-client privilege. Fitzpatrick also argued that disclosing details from the report would violate Piccinini's protections as outlined in the Firefighters Procedural Bill of Rights Act. The act, signed into law in 2007, exempts statements that firefighters make under duress or in administrative proceedings from being used against them in criminal cases. Fitzpatrick said that police investigators and representatives with the Shasta County District Attorney's Office also have sought copies of the board's investigative report. But at a hearing on Friday, Superior Court Judge William Gallagher stipulated that law enforcement officers investigating the case wouldn't be able to see Piccinini's statements, Fitzpatrick said. "If the whole report was handed over to the press and to the public, it's no different than it being handed to the police," Fitzpatrick said. Marlow nonetheless ruled that the report should be public, since the civil case and the criminal case were entirely separate matters. "There's a conflict of the statutes, the Firefighters' Bill of Rights versus the public's right to know," she said. Shasta County District Attorney Jerry Benito said Monday that he was pleased with Marlow's ruling, since it grants investigators access to the key document in Piccinini's case. "It would be inappropriate to go forward to determine whether criminal prosecution was warranted knowing that there's a lengthy and detailed report prepared that we don't have," Benito said. The case is under investigation by the Redding Police Department. The matter has been assigned to Deputy District Attorney Erin Dervin, who handles financial crimes cases and matters of alleged impropriety involving public officials, Benito said. Though it fell under the jurisdiction of the Anderson Police Department, Redding police are investigating the case to avoid any appearance of a conflict of interest since Anderson's former police chief, Neil Purcell, was the investigator the fire board hired in Piccinini's case, Benito said. Marlow also ruled that the civil case didn't fall under the protection of confidential discussions between a client and an attorney, since the district's board members had instigated the investigation and the investigator was acting at the behest of the board, not its attorney. Marlow ruled that the names of all employees except Piccinini's be redacted from the report. She didn't set a specific timeline for redaction and release of the documents. There were 30 or so witnesses interviewed in the investigation, conducted by Purcell. Piccinini resigned July 1 after being placed on administrative leave in May. Neither he nor the fire board has offered an explanation of the resignation or disclosed the findings of the investigation. Piccinini has said he did nothing wrong. When reached by phone Monday, Piccinini said to contact his Gold River attorney, Dan Thompson. Thompson, who did not attend the Monday court session, said later that that he was surprised by Marlow's ruling, calling it potentially far-reaching. It's his concern that the ruling may affect the confidentiality of police and fire management personnel throughout the state. "That's a pretty earth-shattering decision, to be frank," he said. He said he will try to obtain a written copy of the ruling so he could determine what the next legal step might be, such as an appeal. "We're certainly not ruling that out," he said. Purcell's investigation cost the district at least $41,000. Aside from turning over copies of the report, the board may have to reimburse the newspaper for its attorney's fees. Under the California Public Records Act, a government agency can be ordered to pay attorneys' fees for someone who asks for public records, is denied and has to sue in order to get copies. The Record Searchlight made its initial records act request for the report last summer. Record Searchlight Editor Silas Lyons declined Monday to say how much the newspaper has paid its Redding attorney, Walter McNeill, as a final bill hasn't yet been tallied. But the case, he said, is similar to other suits the newspaper filed and won against the city of Redding in April 2008 and against the Dunsmuir Union High School District in January 2007. Dunsmuir paid the paper $64,000 to reimburse McNeill for the precedent-setting case, which went all the way to the California Supreme Court. Redding paid the paper $36,288 in reimbursement. "It was important to take this issue to court because our community deserves better than official secrecy when someone as trusted and important as a fire chief is investigated for wrongdoing and then resigns," Lyons said. "For months, we have asked the fire district's leadership and attorney to do the right thing and release this public document without an expensive legal fight. Eventually, they asked us to file suit, so we did. We'll continue to push as hard as we must on any case that threatens open government in the north state." Reporter Jim Schultz contributed to this report.